Terrestrial tropical methane seep habitats are important ecosystems in the methane cycle. Methane oxidizing bacteria play a key role in these ecosystems as they reduce methane emissions to the atmosphere. 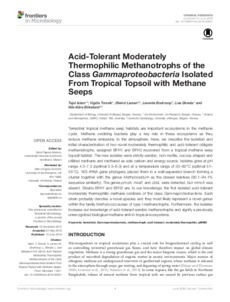 Here, we describe the isolation and initial characterization of two novel moderately thermophilic and acid-tolerant obligate methanotrophs, assigned BFH1 and BFH2 recovered from a tropical methane seep topsoil habitat. The new isolates were strictly aerobic, non-motile, coccus-shaped and utilized methane and methanol as sole carbon and energy source. Isolates grew at pH range 4.2�5 (optimal 5.5�0) and at a temperature range of 30�癈 (optimal 51�癈). 16S rRNA gene phylogeny placed them in a well-separated branch forming a cluster together with the genus Methylocaldum as the closest relatives (93.1�.1% sequence similarity). The genes pmoA, mxaF, and cbbL were detected, but mmoX was absent. Strains BFH1 and BFH2 are, to our knowledge, the first isolated acid-tolerant moderately thermophilic methane oxidizers of the class Gammaproteobacteria. Each strain probably denotes a novel species and they most likely represent a novel genus within the family Methylococcaceae of type I methanotrophs. Furthermore, the isolates increase our knowledge of acid-tolerant aerobic methanotrophs and signify a previously unrecognized biological methane sink in tropical ecosystems.